Or are you keeping the first one sealed for collectors-purposes? It's all been a bit of a mess to be honest. First I ordered 2 but the order got delayed because it was waiting for other things that they didn't have in stock at that time so I cancelled the order thinking I could get it more easily somewhere else. Big mistake! Most of the places I've checked either won't ship to the UK or didn't have it in stock. Plus my German isn't very good which made the whole thing that much more... challenging. So in the end I placed another order with the same place I'd ordered it from originally and treated myself to 5 instead of 2 to make up for lost time. And that's what really happened! I'm happy to see this created too. I've often wanting a smaller easy to transport edition of the game. It's good to hear the base game travels well too. I've not quite had time to analyse the difference in the tile count, I had assumed 2/3rd of the base game palettes would be used, but instead 2x4 palettes have been created. I'm interested to see what difference these tiles make to the gameplay. 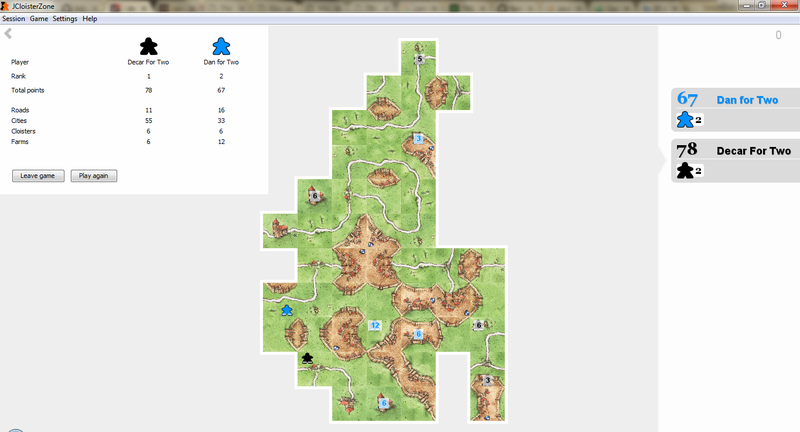 It's pretty clear Hans Im Glueck has spent some effort creating this because the tile distribution is quite different from regular Carcassonne. 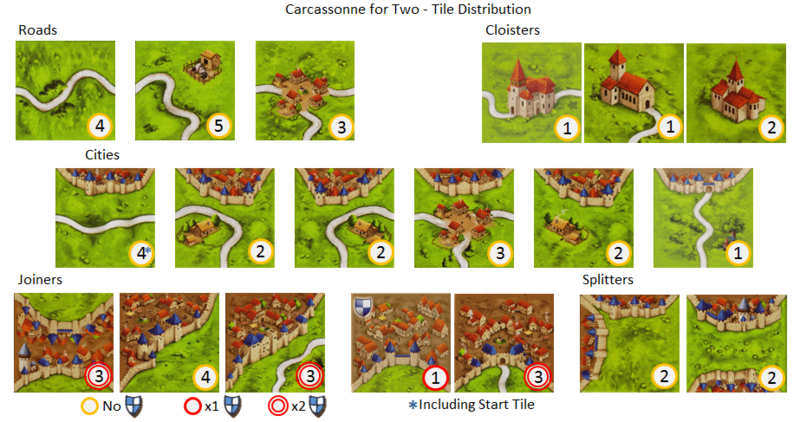 As one might expect there are significantly less road tiles, which don't score a great deal of points in 2-player Carcassonne, but I believe this will reduce the size of farms and limit the use of the CRRF tile and it's counterpart tile for glomming. I've also noticed there are no CCCC or RRRR tiles which is an interesting decision! I just compared the tiles in this set to the 'Demo edition' and observed some more interesting stuff. The demo edition has a RRRR tile, it also has a CCFF tile with a pennant which the Carcassonne For Two game doesn't have either. There's definitely some consideration for adding the two sets together too. All in all, I really can't wait to get my hands on this now. By all accounts it really looks like the game as been carefully considered for 2-players and hopefully introduce the game tactics of the game for more people too! The first game saw us fighting for a large farm, a little early to be honest. Thankfully Dan thought there were more CFFF tiles than there actually were. So snapped back the points I lost investing into the farm too early. 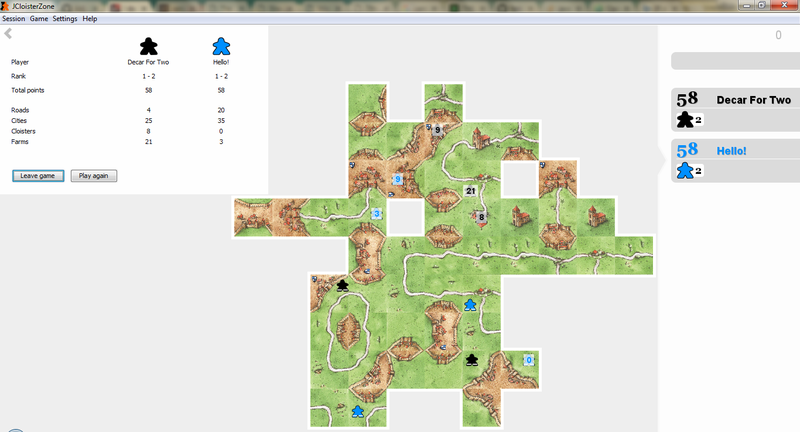 Carcassonne For Two is a very intense game, especially with so few meeple. The mid-game starts very quickly and the end-game is very quick indeed. I got lucky on my 2nd game, but mainly because Dan's not had the chance to measure the tile distribution. Thanks for taking the time to try out the modified JCloisterzone Dan! Thanks for the games Decar! Probably worth mentioning that I accidentally cheated in the first game and used one of the 2 meeples I shouldn't have had to claim a 4-point city. So in actual fact this was a win to you as well! No the demo had RRRR. What neither have is CCCC! Somehow I never knew you were from the UK wolnic. Whereabouts are you from? I ordered from Cundco recently too, so hopefully mine will arrive soon. This has eluded me so far! Anyone know if there is likely to be a UK release of this?